Two VIP Queens + 1 Small Double, each with private bathroom. Crew are self-contained. 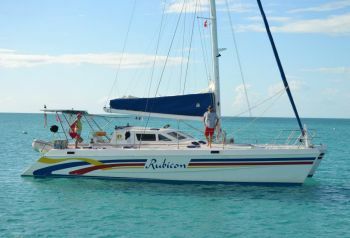 Charter the 44′ catamaran RUBICON for a cruise through the Exumas of the Bahamas, starting and ending in Georgetown. Operated by Capt Adam Dreffin, who is the son of Peter and Tina Drefin of the well-known Bahamian charter yacht FREEBIRD, RUBICON is a well-known charter yacht in the Bahamas, offering guests kitesurfing lessons, freediving activities, snorkeling, and of course all manner of spearfishing and fishing! RUBICON offers slightly more space than the 44′ catamaran FREEBIRD, and is slightly smaller than the 50′ catamaran SWISH, which is run by the other Dreffin son out of Georgetown. One yacht for each son and one for the parents, all three yachts share the video below from Bahamian Catamaran Charters. Adam Dreffin holds an MCA Master of Yachts 200 Tons. Adam was born in the Exumas aboard the boat of his parent’s, Peter and Tina Dreffin. 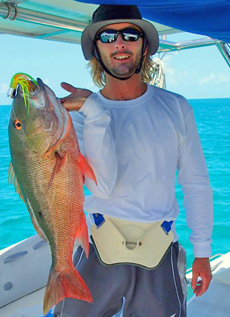 At a young age, Adam disappeared into hidden coves with his brother, trolling for fish while handling a sailing dinghy, so he knows the Bahamas islands very well. He shot his first lobster at age 6. His passion for the islands is evident in his very presence. Adam’s parents, along with his younger brother Warren, all set off for a world cruise on their sailing boat once the boys reached teenage years, so Adam is also very widely travelled to many exotic parts of the world. When they reached Australia the boys went to school and college there, whilst their parents continued their cruise back home to the Bahamas. 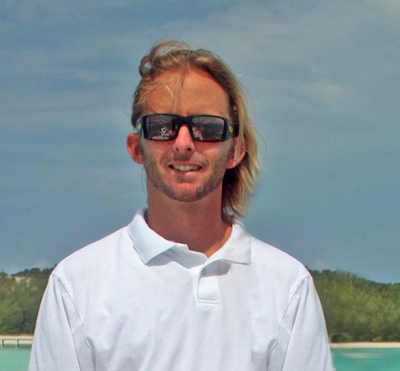 Adam is an avid kitesurfer and knows where the best places to kitesurf are. Adam is assisted by a chef/first mate Kaley Rawlins. The luxury sailing yacht Rubicon offers the perfect way to enjoy your Bahamas vacation. This spacious 44’ catamaran offers the best of everything that makes a yacht charter vacation great: beautiful, comfortable accommodations, an expert and enjoyable crew, fabulous food, and so many fun things to see and experience. There are many comfortable places on board to enjoy! The main salon, cockpit, and forward trampolines are the main gathering areas for meals and activities. The trampoline area is the optimum spot to hang out while underway, enjoying the salt breeze and luscious scenery of the islands. She accommodates up to 6 guests in three private cabins described below. Each stateroom is equipped with ensuite bath and electric fans in each cabin, as well as A/C. 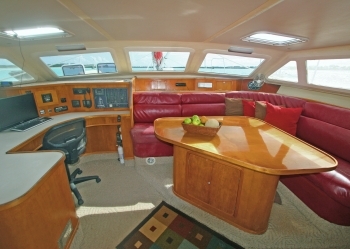 CABIN 1: Port side forward, featuring a queen-sized berth, large opening hatch overhead, 2 large closets, 2 bedside shelves. (Cabins 1 & 2 are equivalent in layout.) A private bath and shower adjoins. CABIN 2: Starboard side forward, featuring a queen-sized berth, large opening hatch overhead, 2 large closets and 2 beside shelves. (Cabins 1 & 2 are equivalent in layout.) A private bath and shower adjoins. CABIN 3: Port side aft, a small double bed 42″x78″, ideal for 2 children or small couple, large opening hatch overhead, dresser and vanity. Adjoining, is a private bath. If you have ever wanted to sleep under the stars, Rubicon’s trampolines also offer spacious star-spangled sleeping quarters. Rubicon also has trampoline awnings for the fore deck. Here is a fun video of a group of Kiters that chartered Rubicon recently in the Exumas – enjoy! Option 2: Fly directly into Normans Cay or Staniel Cay. This gives you more island time, saving a full day to/from Great Exuma. Rubicon is based at anchor at Stocking Island, a short dinghy ride across Elizabeth Harbor to Georgetown. When collecting guests, Rubicon has their fav taxi man meet guests at the airport and drive them to the local marina or dock where they meet them. It works very well.